This group from Birmingham (formerly known as the Cyclones) self-composed a great single that was released on Columbia Records in 1964. During the late 1950s, Cadburys employee and football fanatic Ken Hoban who lived in Dawlish Road, Selly Oak, formed a rock ‘n’ roll band called the Wildcats along with guitarist Grant Harvey. By the early 1960s Ken was the lead vocalist of another another group called The Rayvons. This band consisted of drummer Colin Fortnam, guitarists Bob Bradley and Malcolm Gamble, plus Malcolm Hamilton on bass guitar. Ken Hoban changed his name to Mark Raymond as to fit better with the Rayvons name and the group was soon playing regularly throughout the Birmingham area. A chance meeting with agent Bob Wooler, who had gone to see the Rayvons perform at the Majestic Ballroom in Birmingham, resulted in the group being booked to appear at Liverpool’s famous Cavern Club. The Rayvons were well received at the Cavern and they were able to play there many times. In 1963, Mark Raymond left The Rayvons and replaced the singer of another band called The Cyclones who had formed in Birmingham in the early 1960s. The Cyclones included lead guitarist “Chalky” Marsh who was born in Dover and lived in King’s Heath; drummer Pete Dawson was from Stirchley and rhythm guitarist Bernard Robinson and bass guitarist Phil Riches both lived in Warstock. The group’s booking agent was Terry Blood who lived in Stoke-on-Trent. Despite playing regular bookings in Birmingham and the surrounding area, the band remained semi-professional and they all continued to work at day jobs which by now comprised of bricklayer (Mark), and the others – joiner, lab technician, clerk, and auditor. Mark Raymond and The Cyclones missed out on Norrie Paramore’s famous “Brum Beat” auditions at The Moathouse Club in June of 1963 but made up for it when they were auditioned the following year at The Crown in Birmingham by Bob Barratt of Columbia Records and were offered a contract. The Cyclones went down to London and recorded several tracks at the famous Abbey Road Studios (they went in right after Cliff Richard and The Shadows had been recording On The Beach) and one song that was composed by the band was selected as the A-side of their first single. The song was called Girls and Mark Raymond came up with the words – supposedly while at church on a Sunday morning – and guitarist Roger Marsh put the music to it. The result was a brilliant and catchy piece of songwriting that also featured Norrie Paramore playing piano on the track. For the B-side of the single, a Bob Barratt song called Remember Me To Julie was selected. The band spent a total of three days recording in London, but a problem arose when it was pointed out that there was already an American recording group called the Cyclones. 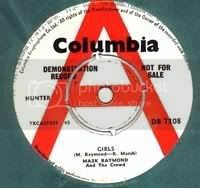 Another name was came up with and the single was released under the new group name of “Mark Raymond and The Crowd”. Despite the commercial appeal of the disc, Girls somehow missed out on a chart placing and unfortunately would turn out to be the only record release from Mark Raymond and The Crowd. For more information about this band go to http://www.btinternet.com/~keith.hob…2s/bobcats.htm – The Bobcats Birmingham Band 1960s website maintained by Keith Hoban.